Today the Friendly Foot Care is a team of more than 10 people providing Northwest Indiana with state-of-the art foot and ankle care and surgery in a custom-designed facility on Broadway in Crown Point, Indiana. 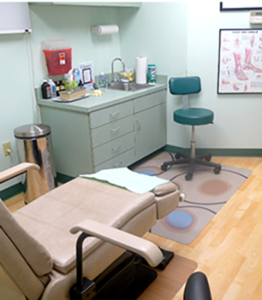 Our Northwest Indiana podiatrist practice helps alleviate heel, foot and ankle problems for thousands of people each year. We are grateful for the wonderful patients who have visited us for their foot and ankle care. The story of Friendly Foot Care providing patients with foot care began more than a quarter century ago and hundreds of miles away. Dr. Nirenberg grew up the oldest of three children in Toronto, Canada. He had working-class parents and as a teenager did an assortment of odd jobs, including shoveling snow-covered driveways and performing magic shows for children. There were few luxuries. His parents did not have the connections that are usually associated with getting into medical/podiatry school. Dr. Nirenberg became interested in becoming a podiatrist when he was in his early twenties studying pure mathematics at the University of Western Ontario. At the time, his father, who had been plagued with knee pain, told him that a podiatrist had cured his knee pain by making him custom-made arch supports (orthotics). By improving the mechanics of how his father walked,the podiatrist had alleviated his knee pain. Nirenberg met the podiatrist and became hooked on podiatry. While still a student, Dr. Nirenberg published in the Journal of the American Podiatric Medical Association an article on how podiatrists are helping law enforcement solve crime. The article “Forensic Methods and the Podiatric Physician” won the prestigious “Distinguished Podiatric Writing Award” and became the first (and only!) time that the journal accepted a paper authored solely by a student. Since then, Dr. Nirenberg’s interest in forensic podiatry and assisting law enforcement with solving crime grew. Today, he assists with the analysis of foot and gait related evidence at crime scenes, has worked with the FBI on a homicide, and his work has helped convict murderers. Dr. Nirenberg has published additional articles in the Journal of the American Podiatric Medical Association as well as other renown publications, including the Journal of Forensic and Legal Medicine, Journal of Forensic Sciences, Journal of Forensic Identification. 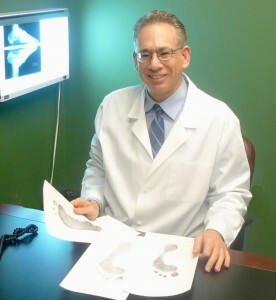 Dr. Nirenberg studied podiatric medicine in Chicago. After graduating as a podiatrist (Doctor of Podiatric Medicine), he furthered his skills by completing an intense residency in foot & ankle surgery. Dr. Nirenberg opened his office in 1992. He could only afford to rent two small treatment rooms at the back of a busy doctor’s office, which was located on 5th Avenue in Gary. Dr. Nirenberg had no employees and no patients, and started the practice by making house calls. As Dr. Nirenberg visited patients in their homes, he found himself listening to them as much as treating them. It was a skill he would use his entire career. Soon the practice grew, and along the way, he became an American citizen—a privilege he values highly. In 2006, Dr. Nirenberg opened his current office, a beautiful facility with wide hallways to accommodate handicapped patients and equipped with the latest foot & ankle technology. Dr. Nirenberg has never forgotten where he came from and continues to show his appreciation to the Friendly Foot Care team members and his patients. Each day he strives to provide the friendliest, warmest, most thorough heel, foot & ankle care possible. Friendly Foot Care’s team leaders Barb, Krystal and Yolanda put their hearts into making sure the office’s dozens of necessary day to day tasks and responsibilities are completed. This is not always easy and involves everything from convincing an insurance company to pay for a needed service for one of our patients to making sure we have a patient’s chart ready when he or she arrives to see one of the foot doctors. These three remarkable women are committed to giving their best, most competent, most friendly service to our patients, each other, and the other members of our team every day. Friendly Foot Care’s other team members include Amanda, our hard-working and caring receptionist, and Amy, our friendly Medical Assistants, and Karin, our warm and detail-oriented Insurance Assistant. Every member of our team who assists with patient care has gone through a rigorous education process leading to certification as a “Certified Podiatric Medical Assistant.” This education process is on-going with the staff continuing to learn about foot and ankle care and new treatments. When people ask what makes Friendly Foot Care different from other podiatry practices, we would like to believe it is our people—they truly care. 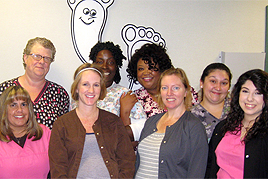 Our Friendly Foot Care team strives to improve our service, technology and foot & ankle medical therapies, techniques and procedures. We look forward to the on-going important privilege of providing patients, their friends and family members, and the Northwest Indiana community with the warmest, friendliest, most-advanced… Quite simply, the BEST foot & ankle care. We see patients from Schererville, Valparaiso, Dyer, Portage, Highland, St. John, Dyer, Cedar Lake, Griffith, Lowell, Wheatfield, DeMotte, Rensselaer, Hammond, Munster, Gary and Chesterton. Please call today (219) 663-2273 to see one our podiatrists or make an appointment online today by clicking here.